A re-enactment of rice cultivation at the festival. 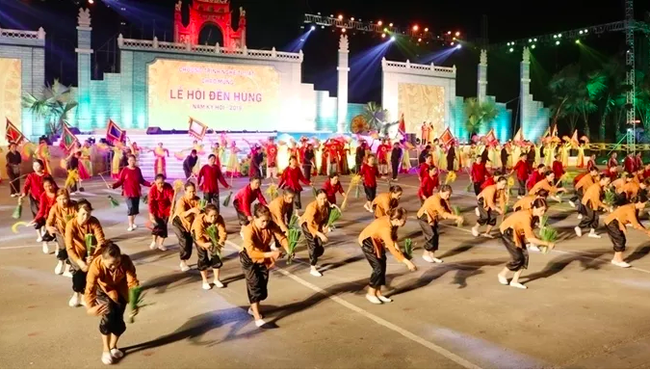 VTV.vn - A folk cultural festival and art programme took place on April 12 in Phu Tho province’s capital city of Viet Tri as a prelude to the main day of the Hung Kings’ Temple Festival, which honours Vietnam’s legendary founders. Activities included drum, dragon and unicorn dances, a procession of sedan chairs and floats that mimicked the cultural values, customs and historical figures in the era of Hung Kings. There were also re-enactments of folk tales such as the Hung King’s teaching local residents to cultivate rice as well as a variety of traditional games to create a vibrant and colourful atmosphere. Following the street festival was an art programme with many engaging performances, especially those honouring two UNESCO heritages, namely the worship of Hung Kings and xoan singing of Phu Tho province. The event ended with a fireworks display to celebrate the Hung Kings’ Temple Festival, the main day of which falls on April 14 this year.